Took the night flight coz we wanted to arrive SH early the next morning and waste no time. 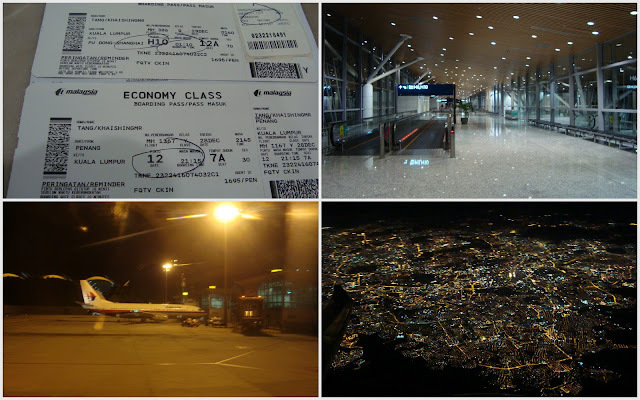 My window seat wasn't comfortable but had a cool night view of KL from the sky. Tried something 'local' for breakfast...煎蛋饼...sorta like pancake but with 油条 in it. 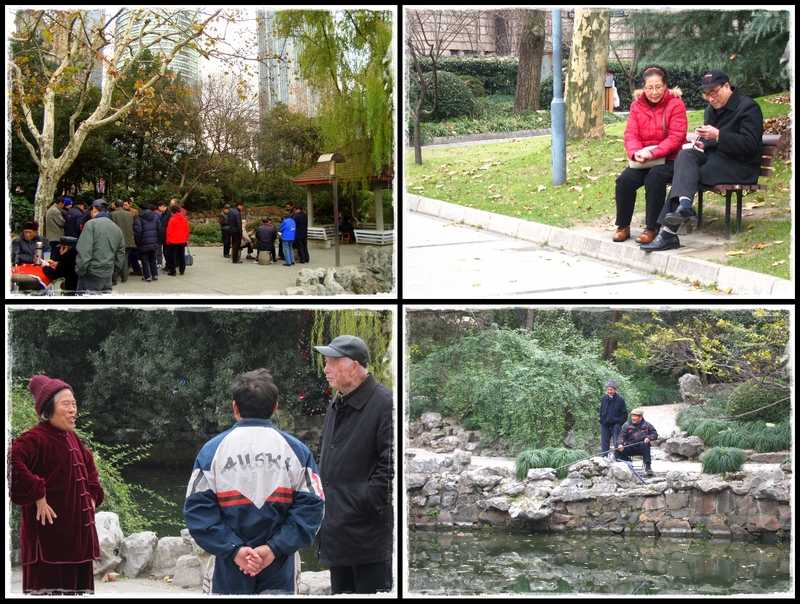 This park is definitely a place for elderly people...taichi, play poker cards, fishing...haha!! Some landmarks around People's Square - Tomorrow Square, Shanghai Art Museum, Shanghai Grand Theatre. 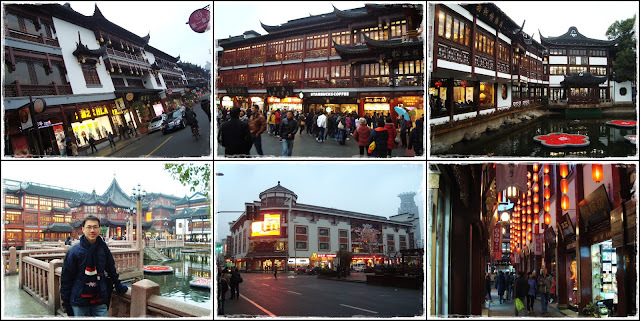 Took the subway from Nanjing East Road (南京东路) to YuYuan Garden (豫园). 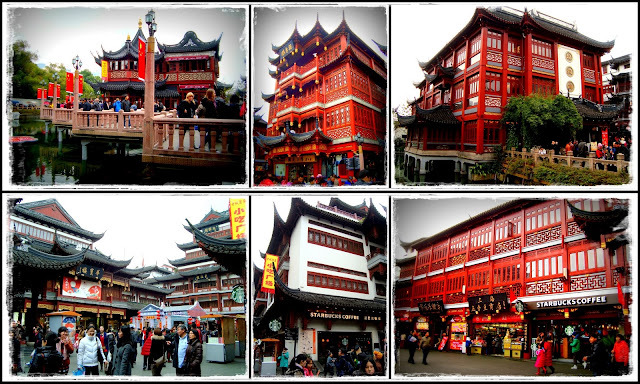 Shanghai Old Street (上海老街) was filled with lotsa ancient architecture. All of the sudden I felt like I was REALLY in China...hahaha! The whole area felt so 'ancient'...it was kinda weird to see Starbucks in such an 'ancient' exterior...lol! 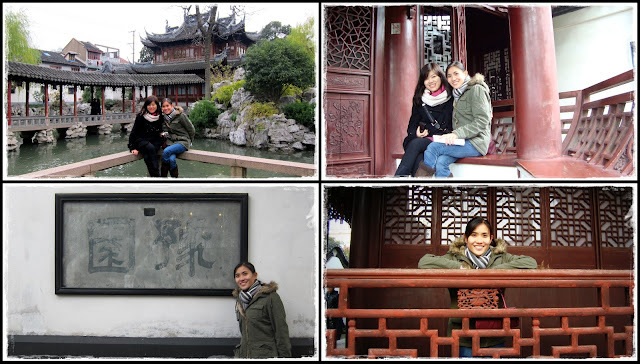 We wanted to have more 'China' feel so paid 30 yuan to visit YuYuan Garden. 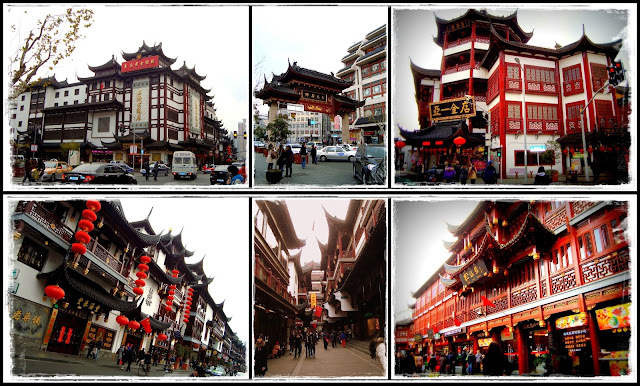 The streets were already filled with Chinese New Year mood! Let's usher into the dragon year!! Last stop for our first day...Xin Tian Di (新天地)...more high-end shopping, eating, and entertainment district. 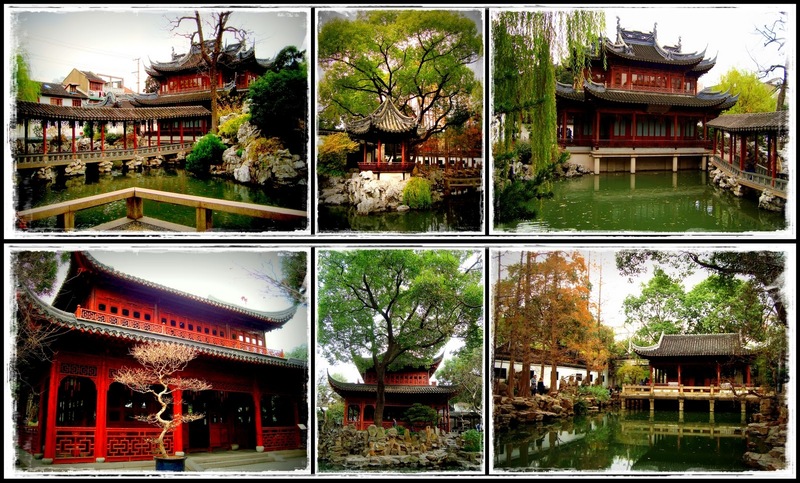 The unique thing about this place is that all the buildings are 'Shikumen' 石库门 style. Dinner at one of the many restaurants in Cloud 9 mall next to our hotel. 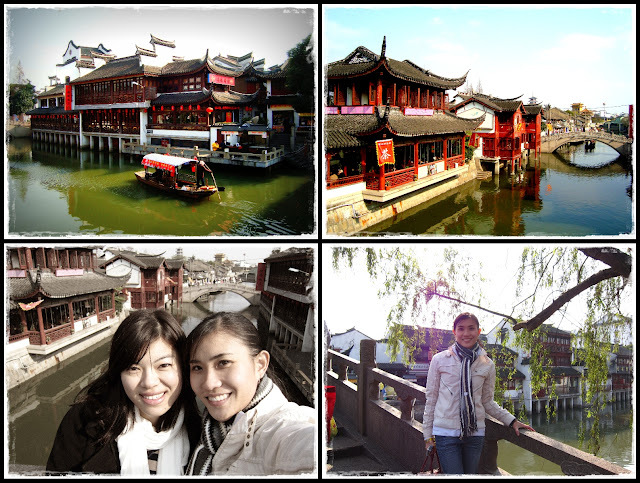 First stop for the 2nd day...Qibao ancient town (七宝古镇). Took us about 45 minutes to get here from the city by metro. 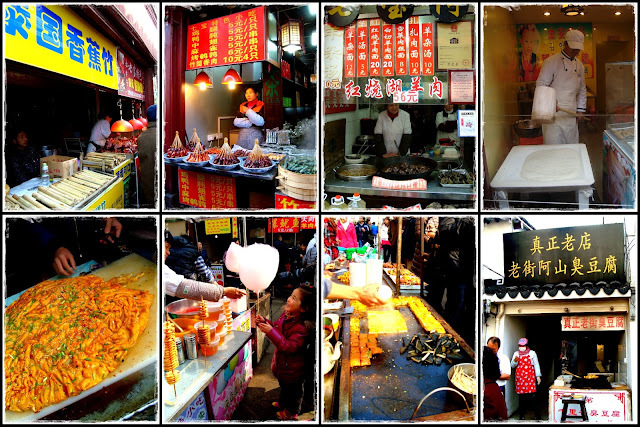 Narrow alleys...ancient buildings...plenty of 'local' snacks. More street snacks!! I'm not an adventurous foodie so all these doesn't attract me...lol! Tried some huge 'Tang Yuan'. One side of the town was bustling with tourists...another side of the town was a quiet old neighbourhood...what a contrast! We also saw an old man sitting by the streets selling popcorns...the 'old-school' way. 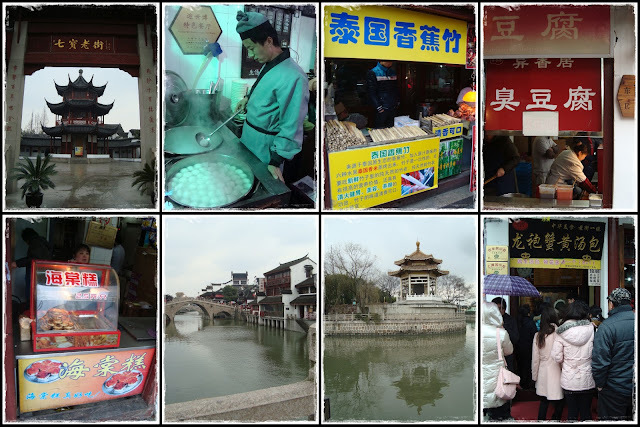 Few more pics before we left Qibao ancient town. 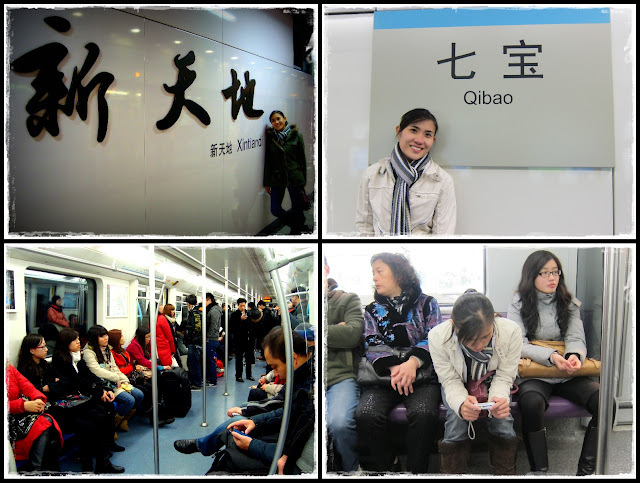 Took the metro back to the vibrant part of the city filled with skyscrapers...Pudong (浦东)...home to many of Shanghai's best-known buildings - Oriental Pearl TV Tower, Shanghai World Financial Center, Jin Mao Building, etc. And of course I've gotta be in these pictures...lol! 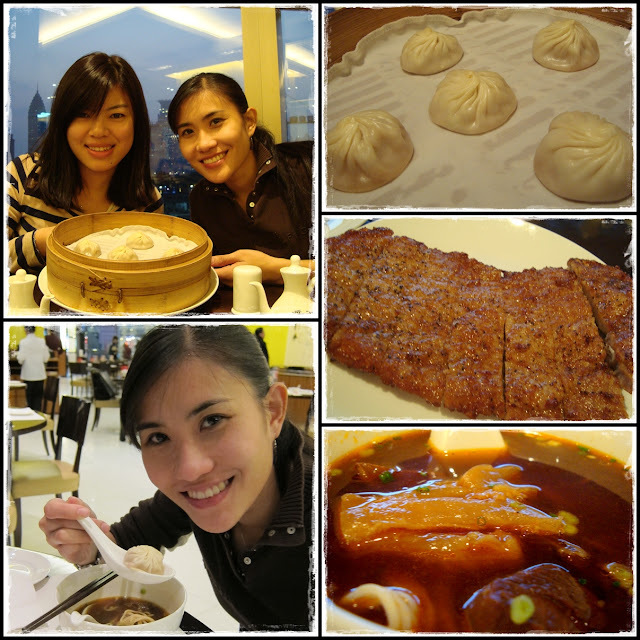 Xiao Long Bao again...hahaha!! 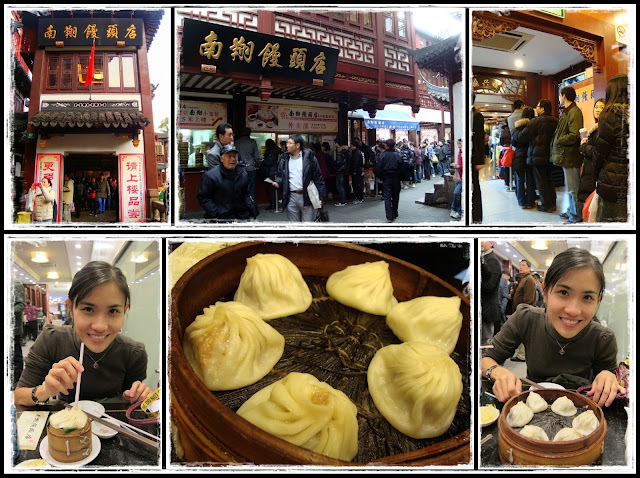 This Xiao Long Bao was better than the one in Nanxiang. 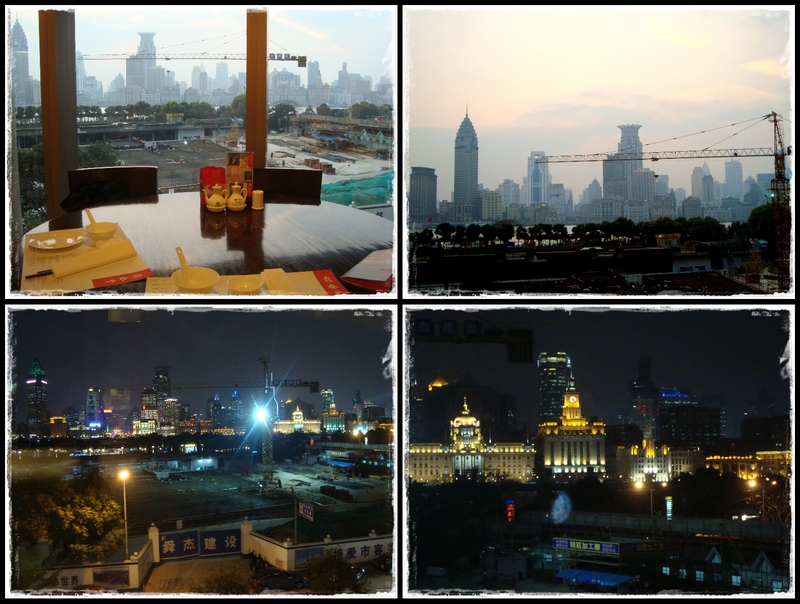 After bumming in the restaurant for hours and trying out Osim's leg massager in the mall, we continued our sightseeing. 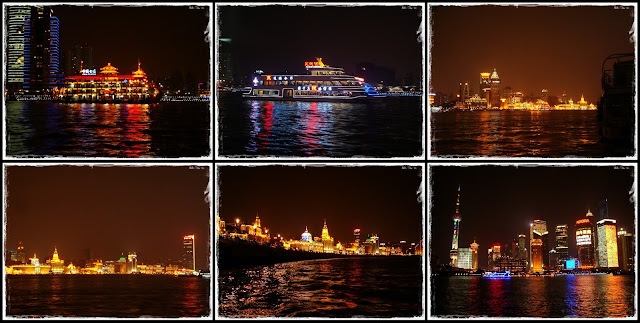 Took a ferry for 2 yuan across the Huangpu river to Puxi (浦西). It's easy to pronounce Puxi wrongly and it will sound totally wrong...haha!! Finally we're at The Bund!!! Beautiful skyline of Pudong at night!! Night view of The Bund. Whole stretch of nice colonial-style buildings. 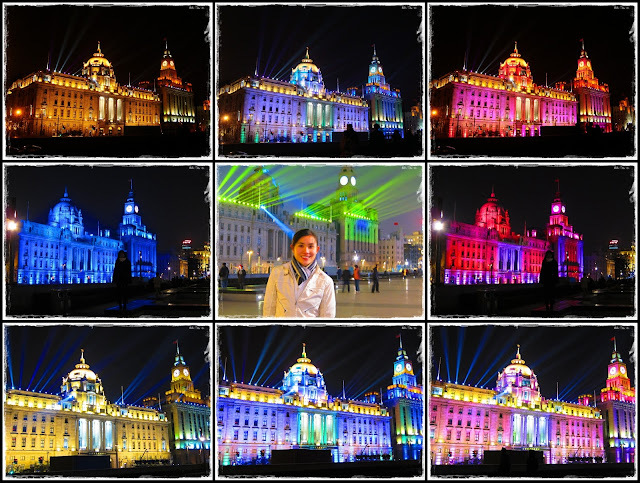 Lucky us we saw some beautiful lightings as we were walking along the Bund coz they were rehearsing for the New Year's Eve countdown 3D light show. =) That's the HSBC Building and the Customs House. 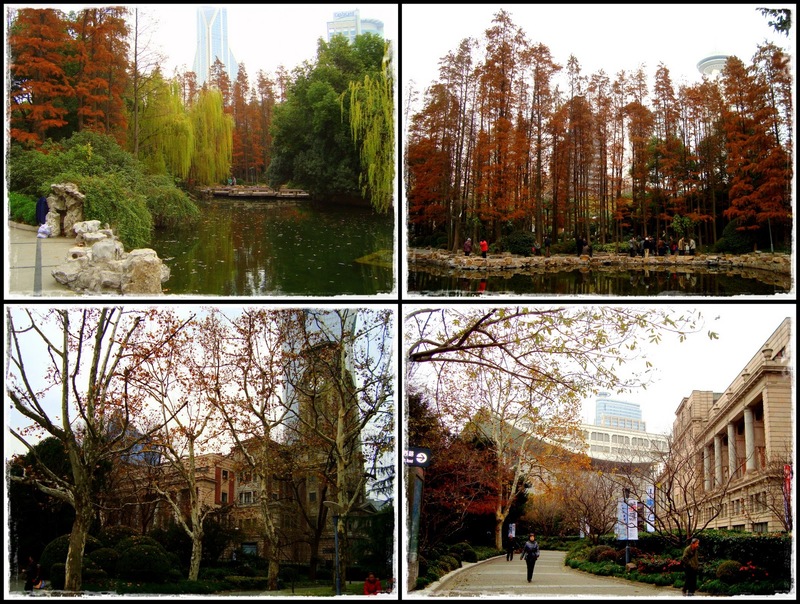 Chillax day...strolled along Nanjing West Road and passed by Jing'An Temple (静安寺) along the way. 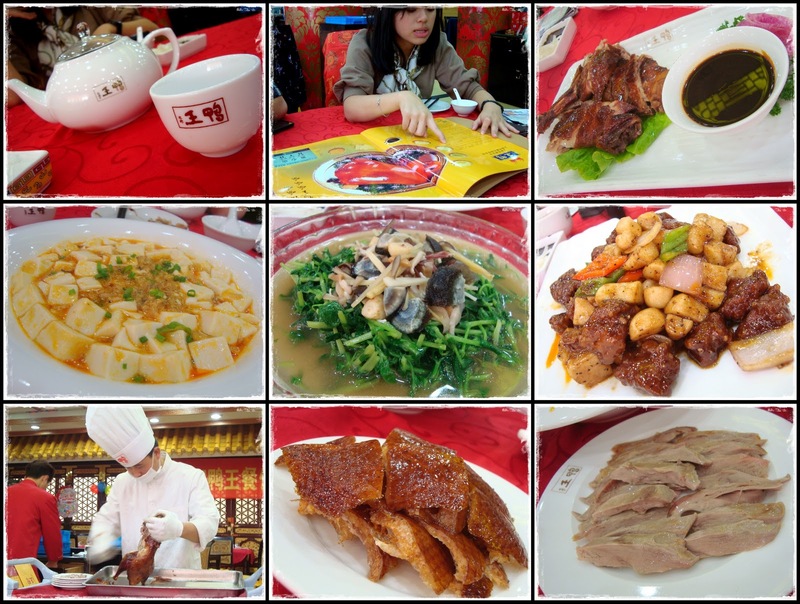 Lunch with the team at 鸭王. 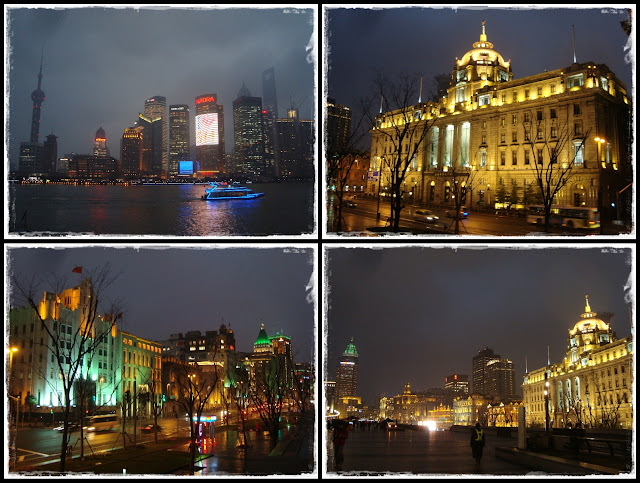 Initially we wanted to wait for the countdown along the Bund but after sitting for 20 minutes, the others were freezing already and couldn't stand waiting in the cold for 2 more hours so we decided to find somewhere else to countdown. 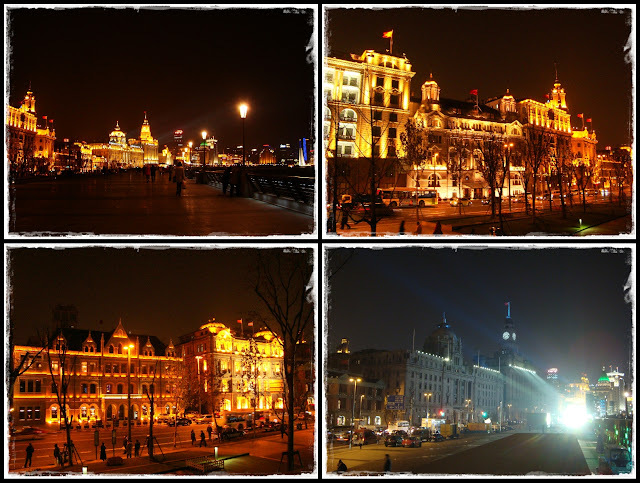 We stumbled upon this place as we were walking along the Bund...The House of Roosevelt. Good job to Ali and Manrou...the very confident duos...we just walked into this posh place as if we've made reservations and went straight up to the 9F rooftop lounge...lol!! Fantastic view of Pudong & The Bund...what a great way to end 2011 and welcome 2012!! 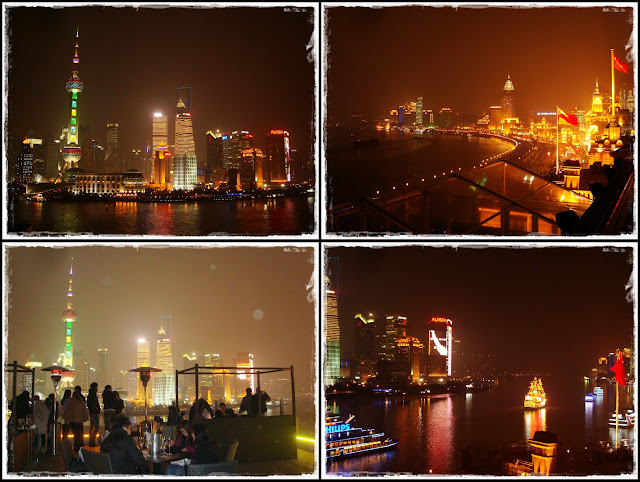 #blessed The only disappointing thing was that there were no fireworks at all in Shanghai for countdown!! =.= No fireworks...in CHINA...seriously?!?! Dinner with the team at Spice Spirit. 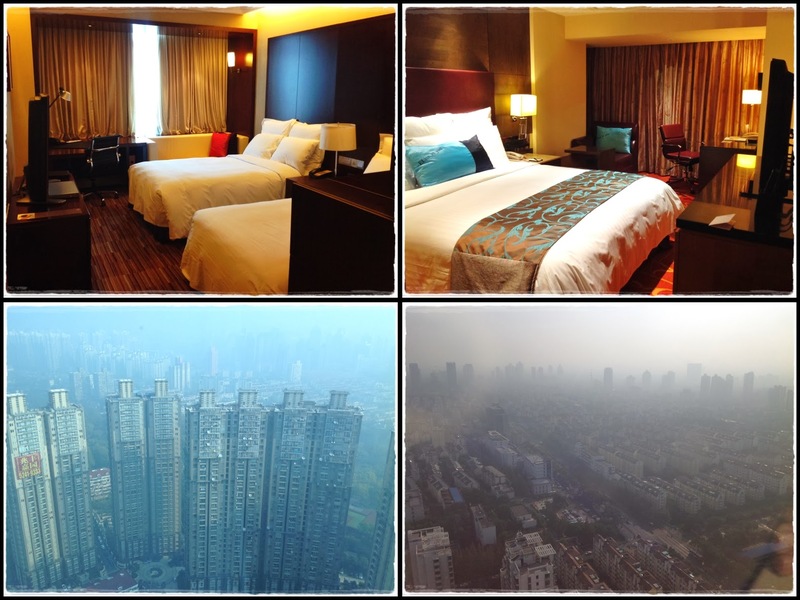 Time to go home...checking out from our hotel...goodbye Shanghai! Lunch before heading to the airport. 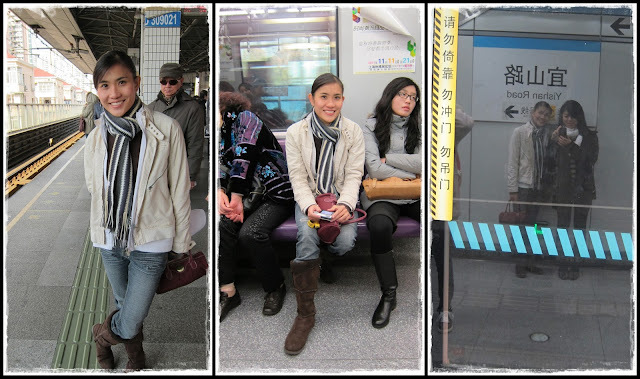 Here's a quick update with some pictures that we took during our short audition trip to Shanghai back in February. I almost forgotten about all these pictures coz we couldn't share it earlier on and it was just sitting in my external hard disc till now. =P This was my 2nd trip to Shanghai and I've already done most of the touristy stuffs during my first trip so I didn't do much sightseeing this time around. We booked our flights and hotel last minute and guess what we ended up with? Both of us burst into laughter the moment we stepped into our room. OMG...a round bed with red velvet background and a mirror above...for us...seriously?!?! Even more hilarious...bro's leg was too long for the bed!! And when we saw the bathroom, we can't stop laughing!! Is this a hotel or a motel...lol!! 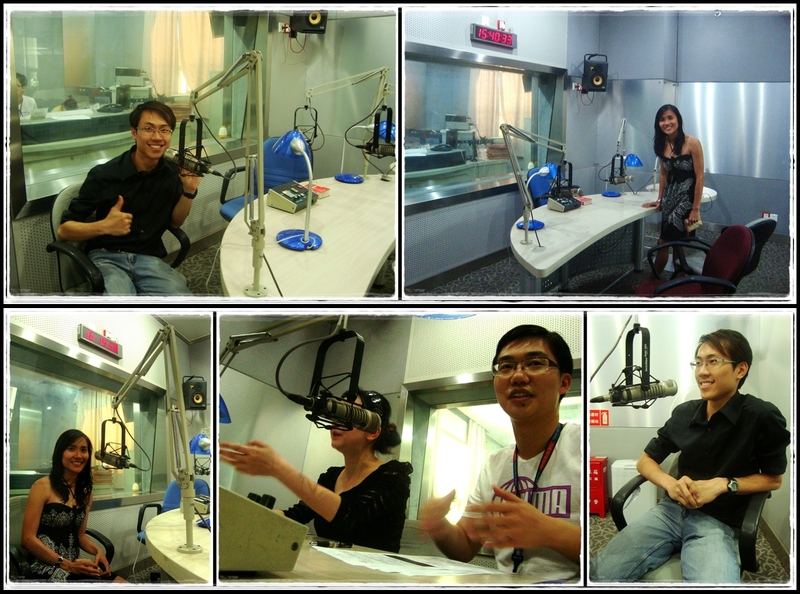 We didn't bother much about it coz we were rushing to go for our audition. 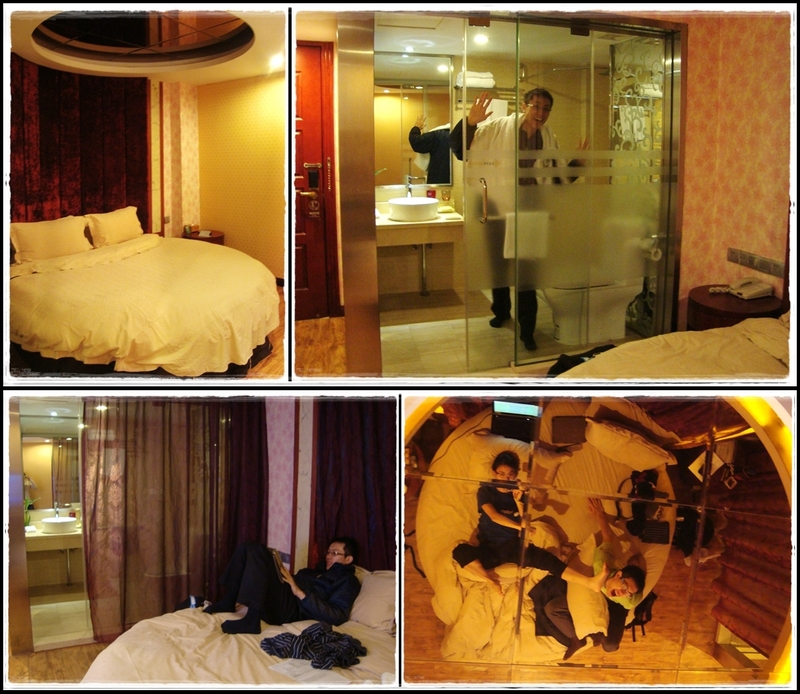 But when we came back in the afternoon, they put a curtain for the bathroom already...thank god...lol!! But generally the hotel was pretty decent. So funny! After our audition, we walked to XinTianDi for lunch at DinTaiFung. 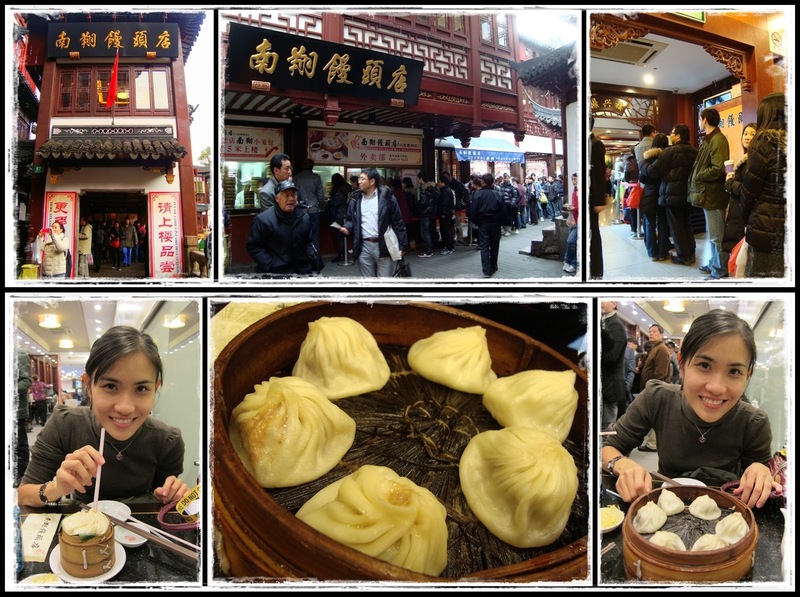 This was my recommendation coz I preferred the xiao long bao here. 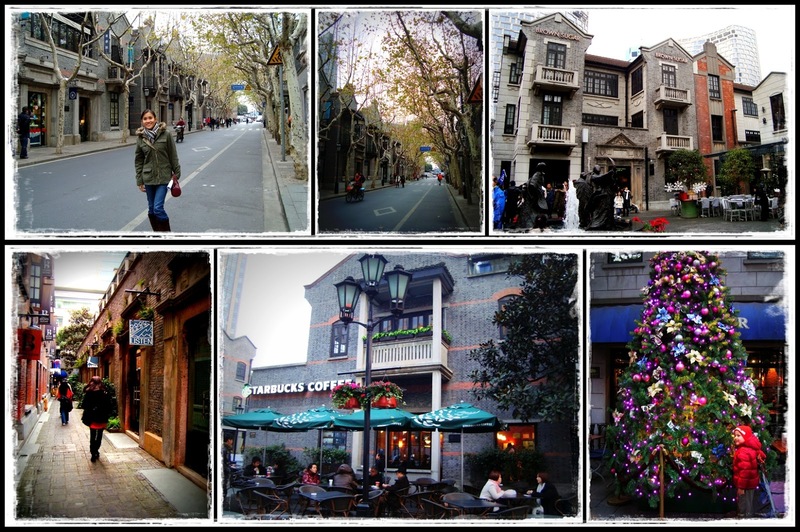 Bro's touristy photos at XinTianDi. 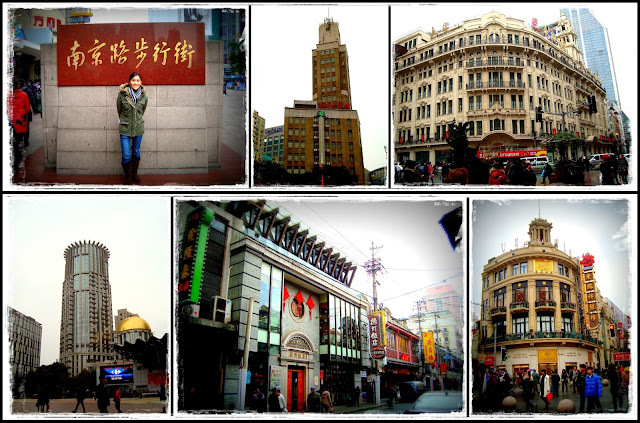 After accompanying me back to the hotel, bro continued his sightseeing around the city. 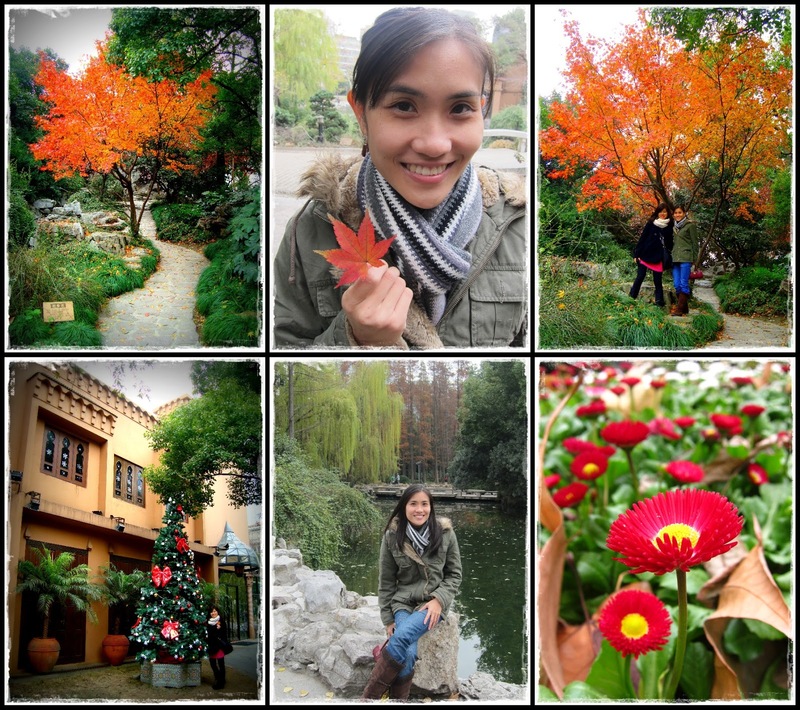 His first stop...YuYuan Garden. I decided to stay in the hotel room to do my work (yes I had to work over the weekend) instead of going out coz I had work deadlines to meet and it was so freakin' cold out there! The next morning, bro woke up early to go to Qibao Ancient Street alone before catching our flight back to Malaysia in the afternoon. It was raining and freezing that morning so he almost turned into a popsicle when he came back to the hotel. That's all for our super short journey to Shanghai...a journey that gave us the opportunity of a lifetime to be in the Amazing Race!! Quote to share: "Life doesn't hold tryouts; you may be disappointed if you fail but you're doomed if you don't try. The journey of a lifetime begins with a single step." 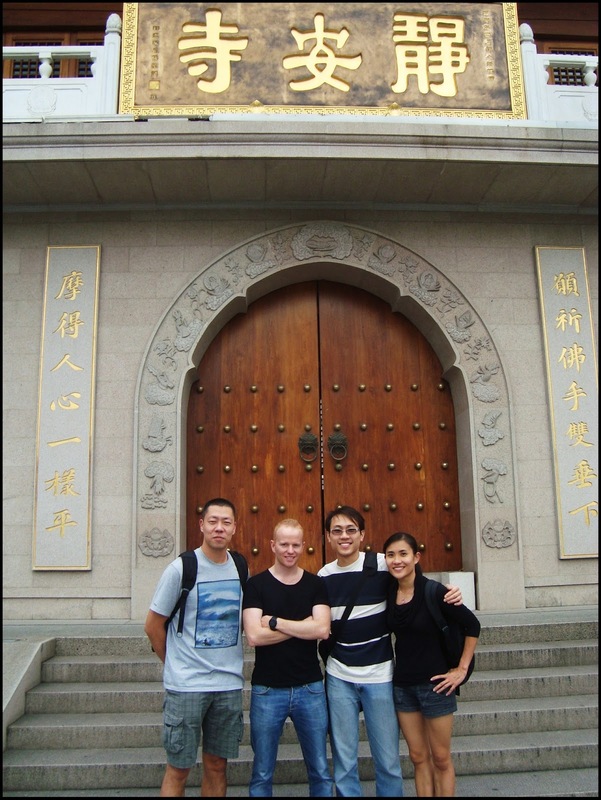 15-17 Sept 2012 (Sat - Mon): ChinaRush-themed Weekend Getaway! 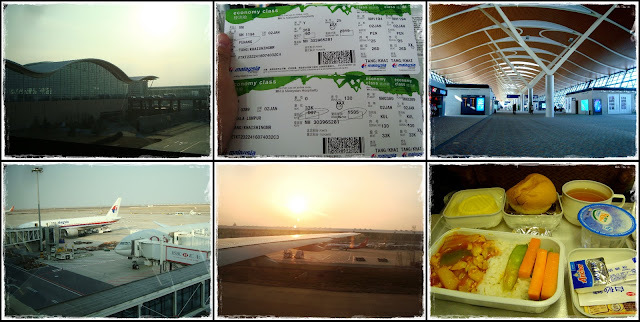 Took an overnight flight from Penang to Shanghai. 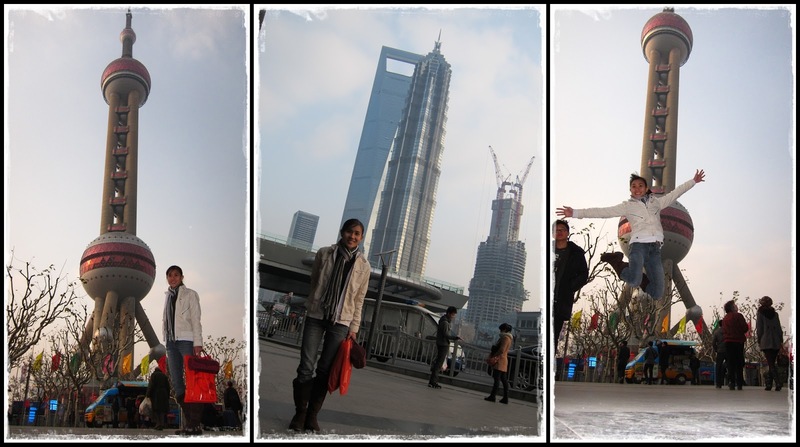 This was my 5th trip to Shanghai within a year...lol!! Lei Sheng brought us around TianZiFang for a stroll after lunch. Spotted some Matryoshka dolls in one of the shops...haha!! Went to Lei Sheng's hotel to catch the Chinese version of Episode 3 on Dragon TV...finally got to watch ourselves on live TV broadcast...hahaha!! Yating invited us over to her house for home-made dinner...a dinner filled with lotsa laughters. 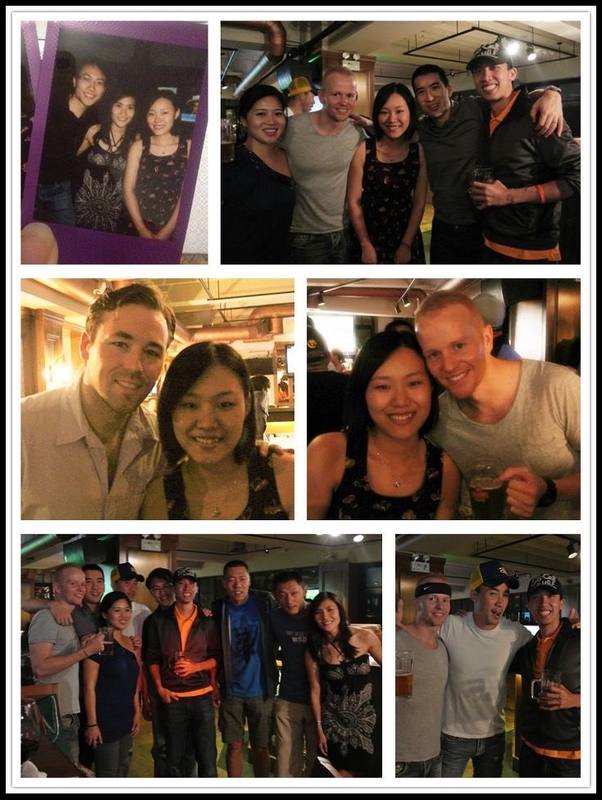 =) Had a great time hanging out with her again after the race...she's still as bubbly as ever...good times!! Knowing that we would be in town for the weekend, ICS arranged for us to attend a local radio show (FM93.4 轻松集结号) to promote the show. Trainers and us shooting some promo for ICS. Had Taiwanese cuisine for dinner with some production crew after the radio show at Charmant. Thanks to the girls for the treat!! 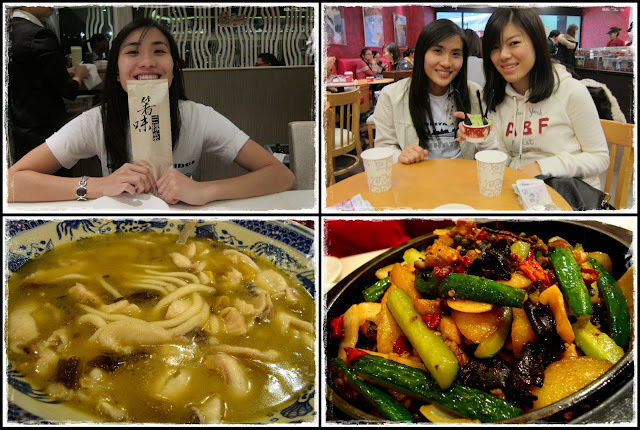 =) Coincidentally, we had dinner at the same place same table with Henry, Jenn, and Brandon few months back...haha!! Quite a lot of people turned up for this viewing party and 5.5 teams were there. =) The 'stars' for the night...Henry & Jenn (Newlyweds), Nick & Brandon (Neighbours), Lei Sheng & WeiWei (Trainers), Yu Ping & Yu ChenJing (Father-Daughter), Khai Sheng & Khai Shing (Twins), Ryan (Harvard), Allan Wu! Credits to Selena for these pics. Looking forward to see more pics for the finale on Nov 11. Brunch with Brandon before he sent us off to the airport. That's all for our short ChinaRush weekend getaway. Finally managed to bring back our Yanji souvenirs. Time to work on my EP4 behind-the-scenes update. 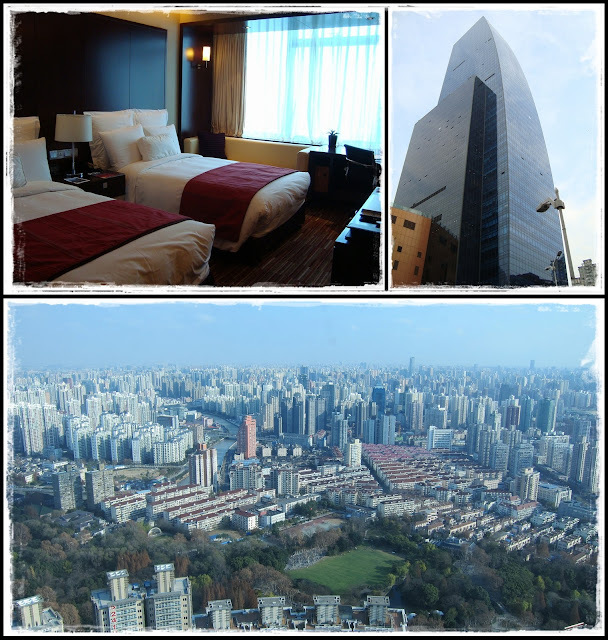 Stayed in Renaissance Shanghai Zhongshan Park Hotel & Suzhou Marriott Hotel. Magnificent 'polluted' view of both cities...lol!! Took a direct airport shuttle from Suzhou to Pudong airport for only RMB 84...very convenient.